The combination of site fertility, climate, and species composition influences forest productivity. Productivity is a measure of potential energy of a site and can be divided into either gross productivity, which includes all production, or net productivity which excludes produc tion used in respiration. A group oftrees growing together on a site of similar soil and climate and having similar structure is called a stand. 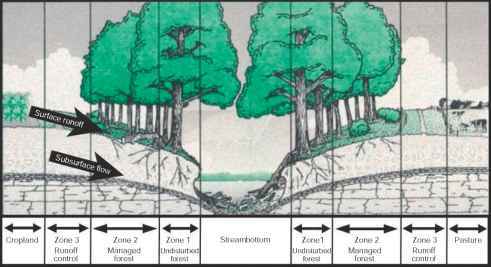 Individual tree growth can be thought of as annual growth increment, whereas stand growth is the total sum of all trees in an area. Some evidence exists that forest productivity can increase with species mixtures because of the different ways resources are exploited and space is shared. At different levels of competition, a tradeoff exists between individual tree growth and the growth of a stand, as illustrated by Figure 4.